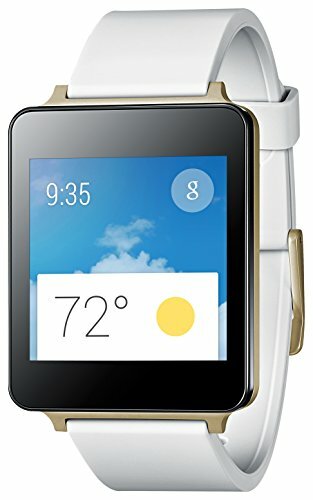 LG G Smart Watch for select Android devices. 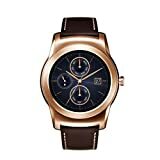 Bluetooth 4.0 technology lets you easily sync with your compatible Android device to this LG G Watch, so you can receive and view important mobile notifications on the 2.2" touch-screen LCD. Stay on top of your day while you're on the run with this LG watch, featuring Android compatibility to keep you connected. Touchscreen function and a virtual keyboard let you send texts and documents, and Bluetooh compatibility helps you track your to-do list. This LG watch features sleek silver style that transitions easily from workday to night. Specification - DISPLAY 1.3" Full Circle P-OLED, 320 x 320 pixels. - DIMENSIONS 45.5 x 52.2 x 10.9mm. - WEIGHT 66.5g. - TOTAL INTERNAL MEMORY 512MB RAM. - 4GB eMMC. - BLUETOOTH® 4.1 LE. - STRAP Stitched Leather, Standard 22mm. - DUST & WATER RESISTANCE IP67. - OS Android Wear. - PROCESSOR 1.2GHz Quad-Core. - SENSORS 9-Axis, PPG. - BATTERY 410mAh. - User Guide in Korean. - Timeless aesthetics. Crafted in stainless steel with a gold or silver finish. The latest technology. Slide your finger across the screen to change watch faces. Switch 22mm straps to match your mood. - LG Watch Urbane is IP67 dust and water resistant (up to 1 meter for up to 30 minutes). Wear it just about everywhere. - FULL CIRCLE P-OLED DISPLAY. - 1.3-inch P-OLED display delivers stunning image clarity all day long, even in bright sunlight. - Power throughout the day with the slim and powerful 410mAh battery. At night, simply attach LG Watch Urbane to the charging cradle.